Plants require water. It's a fact. How you get it to them is up to you, but you may as well have fun with it, and make it as easy as possible while you're at it. Haws V120 Practican Plastic Watering Can, 1.6-Gallon/6-Liter, Green - comes with two spouts - one is a rose, the other a spout. They have handy parking spots right on the can so you don't lose them. 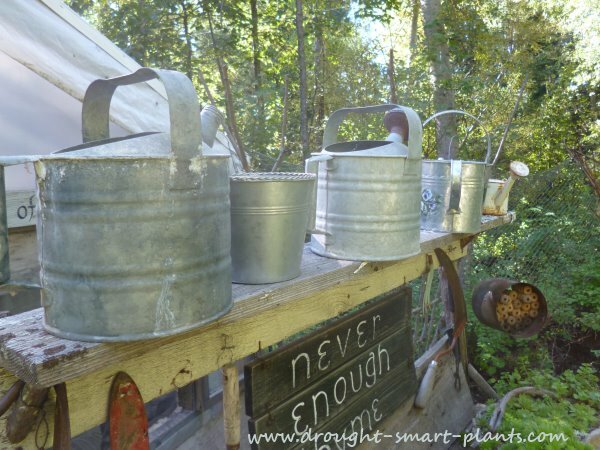 Want to water lots of plants at once, outdoors? Use a sprinkler to give them a good drink. This option is one of the most economical but also the most wasteful if you're on water restrictions. To deliver exactly the right amount of water to individual plants, set up your drip irrigation with a kit. The kits include all the components you'll need to give your plants the right amount, and you can also set it up with a timer so you don't even need to be there. 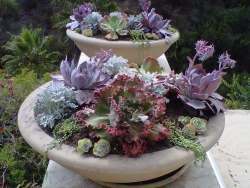 This is the perfect option for pots and containers, but also works well for plants in the ground. And what would gardening be without a few hoses to trip over? The best ones stay flexible even in cold temperatures (such as when you forget to drain them and put them away when fall comes) and have securely attached ends. A timer is essential with drip irrigation and soaker hoses. It's way too easy to forget to turn the system off, and get a flood, or worse - waterlogged plants. Timers attach to the spigot and you can time the exact amount of water your plants will get - many of them can be set to multiple waterings a day if this is what you want. They have two different ends, one a rose which can be put on with the holes facing up to make a gentle rain shower, and the other is a spout to water hanging baskets or other pots. These are kept handy on ports right on the watering can, so they never get lost. They are perfectly balanced, so even when they're full they don't splash all over your legs. I have two of them, and use them for not only the plants, but to measure water for Hypertufa as well. Pump Pressure Water Sprayers for sprinkling seeds once planted, or for very small germinating plants. Some hand held garden sprayers can be used to spray chemicals and pesticides, spray weeds, Neem oil or many other uses. This one comes with a free e-book bundle. 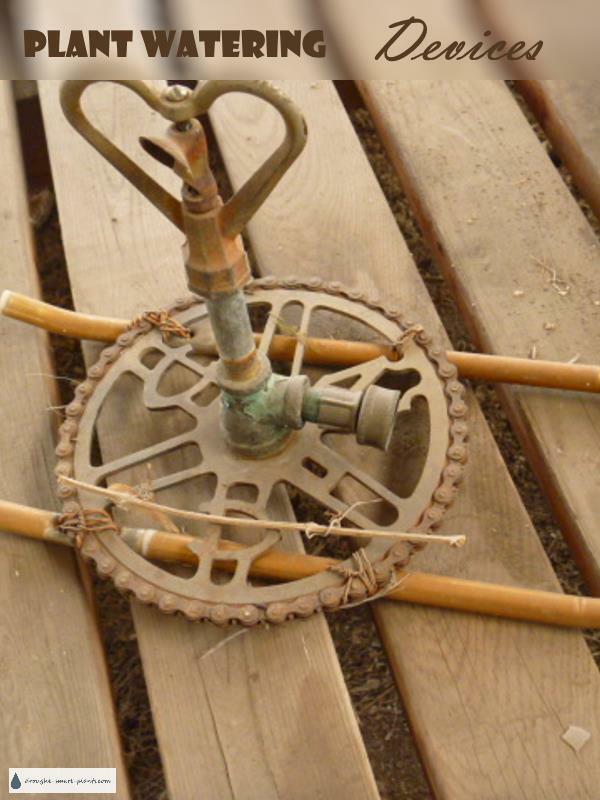 Garden hoses are one of the most essential irrigation tools in any nursery. I’ve spent lots of money on hoses over the years. My best hose at the time is a rubber hose, even though the guarantee promised it would never kink. It’s been a little disappointing, in that regard. I have hoses leading from my rain barrels to other water storage containers or my pond when there is a lot of rainfall. Hose ends - I always try and have on hand a couple of extra hose ends so I can cut a hose in half or cut off a puncture or leak. No leaky hose goes to waste in my nursery! Use this Morvat Heavy Duty Brass Garden Hose Connector Tap Splitter (2 Way) so you can use more than one hose at a time, or not have to move the hose too far. Don't bother getting the cheap ones - they won't last. That way I can set up sprinklers to custom water several areas, either in sequence or at the same time with soaker hoses . Water breakers, or hose end sprayers that can be adjusted for different spray patterns are useful too. I have at least three that see a lot of use, you’ll figure out which are your favorites. I don’t like any that leak all over you when you shut them off, so I always have extra hose gaskets. Sometimes you need two on a given hose to make them seal properly, and sometimes different kinds work better. They come in a flat type, or round profile, so have some of each on hand. I prefer to stock up on this type of thing so production doesn’t come to a standstill just for lack of a hose gasket. Good quality irrigation tools, like all other tools are not just a luxury; they’re essential to keep my nursery running smoothly. As fall approaches, that is the time to take some steps to protect your hoses from damage. Empty them of any water that may still be in them, draining them over a fence, or down a hill. I coil them up, and then screw the hose ends into each other to keep them clean. Store them laid flat on a greenhouse bench to prevent them from cracking in the cold if you're in a cold winter area. Sprayers and nozzles should never be allowed to touch the ground - microbes, yeasts and fungus can be easily transferred by dirty irrigation tools. The occasional dipping into a 10% bleach solution during the growing season will keep diseases in check. 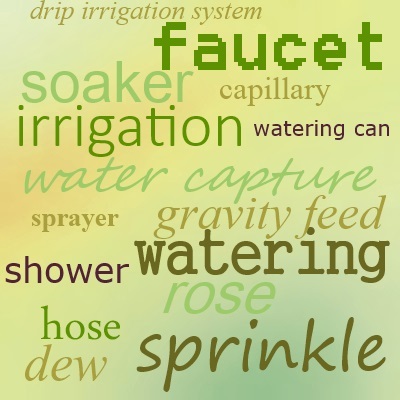 If you buy the best quality irrigation tools you can afford, you’ll find that taking good care of them actually saves time, aggravation and wasted water in the long term.